Cha Tou is a unique Pu-erh. In order to convert sun-dried green tea into ripened Pu-erh tea, a technique called "wodui" processing method is adopted (mixing the pile to ensure fermentation). At the end of the fermentation process, the tea is converted into a wind-blowing appearance. Pu-erh Cha Tou is found near the bottom of the pile of Pu-erh and is formed as a result of heat and relatively high compression, it is a type of Pu-erh tea nugget. 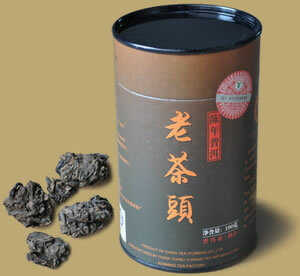 This canister of Pu-erh Cha Tou was released in 2009 by Kunming Tea Factory, the tea gives an ever-smoothening taste, the flavor is rich, mellow and long-lasting. A convenient way to enjoy Pu-erh tea at home, at work or anywhere carrying large tea cakes might be difficult. PREPARATION: To prepare Pu-erh Cha Tou, place about 2 tsp. of tea per serving in a teapot. Rinse by covering with boiling water and quickly pour off. Fill with boiling water again and let steep 5-30 seconds (depending on how light or dark you want the tea) and serve. Pu-erh tea can be steeped 10-20 times.